Home Tags Articles tagged with "RICO"
Kent Volkmer (left) defeated fellow Republican Lando Voyles in last year's race for Pinal County Attorney. 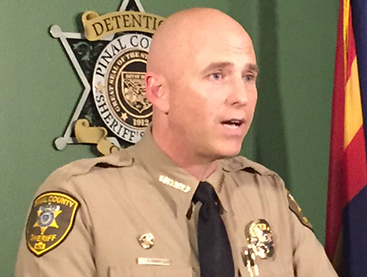 An attorney for former Sheriff Paul Babeu and former Pinal County Attorney Lando Voyles threatened current County Attorney Kent Volkmer with “legal remedies” if he doesn’t apologize for statements he has made about the previous handling of RICO funds. Volkmer brought in the Auditor General’s office to look at the records, which had been controversial both in the acquiring and the dispensing of the funds. The FBI has also investigated the Pinal County Sheriff’s Office. Monday, Marcus A. Kelly of the Scottsdale firm of Goldman & Zwillinger sent to Volkmer’s office what Kelly titled a “defamation letter” but Volkmer’s staff is calling an “anger letter.” It requests an apology and retraction. “I don’t know what statement they want me to apologize for,” Volkmer said. The letter does not specify quotes by Volkmer but claimed he accused Voyles, Babeu and former PCAO chief of staff Dwight Fujimoto of criminal activity. “The statements are demonstrably false and made with malice,” Kelly declared in the letter to Volkmer. He also claimed Volkmer did not do his homework on the history of RICO in the county before calling in investigators. Racketeer Influenced and Corrupt Organizations (RICO) Act of 1970 allows law enforcement agencies to claim the property of organized-crime suspects as forfeiture. They can sell or keep those items, with the funds used to support law-enforcement efforts. The funds may also be distributed to community organizations with goals of law enforcement, gang prevention or intervention. That was left wide open to interpretation, and controversy followed. In 2015, American Civil Liberties Union brought suit on behalf of a San Tan Valley resident who was not involved in a crime committed by her son but had her pickup seized as forfeiture. Last year, a Pima County deputy chief was in court on seven counts of misuse of RICO funds. Despite the process involving a committee and annual audits, residents were still suspicious of politics in the process, and especially of the close ties between PCSO and favorite recipient Arizona Public Safety Foundation. It became a heated part of the election. Volkmer said because the county’s RICO program is a “very formalized process,” most assets are handled properly. But he said there are a “handful of outliers,” like the San Tan Valley case, that deserve investigation. At the moment, he said, there are no funds in the county RICO account. If the program is restarted and the funds are there, they will be used “to support our office and make us better prosecutors,” Volkmer said. RICO funds will be set aside for the county before the community programs.